Nanodroplets, the basis of complex and advanced nanostructures such as quantum rings, quantum dots and quantum dot clusters for future electronic and optoelectronic materials and devices, have attracted the interdisciplinary interest of chemists, physicists and engineers. This book combines experimental and theoretical analyses of nanosized droplets which reveal many attractive properties. Coverage includes nanodroplet synthesis, structure, unique behaviors and their nanofabrication, including chapters on focused ion beam, atomic force microscopy, molecular beam epitaxy and the 'vapor-liquid- solid' route. Particular emphasis is given to the behavior of metallic nanodroplets, water nanodroplets and nanodroplets in polymer and metamaterial nanocomposites. 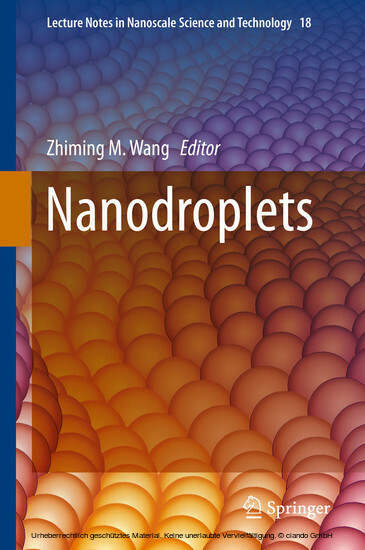 The contributions of leading scientists and their research groups will provide readers with deeper insight into the chemical and physical mechanisms, properties, and potential applications of various nanodroplets.